building materials for all industry which include waterproofing, flooring thermal insulation system, concrete & structural repair and epoxy lining system. The group always aims for better living society and a healthy environment. Thus, the group has diversified into formulating and manufacturing of various kinds of ‘green’ building materials. These manufacturing activities have significantly contributed to the role of import substitution. With the achievement of ISO 9002 recognition in its manufactured products, the Group is presently exporting its manufactured products to 6 countries in Asia Pacific & 4 countries in Middle-east. 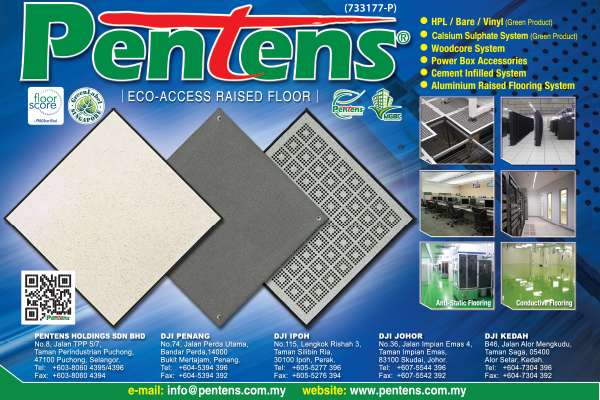 Also, with ‘green’ building materials, Pentens has attained green building material certificate from different countries/organization such as Singapore Green Label, Taiwan Green Label & Malaysia Sirim Eco-Label, which the group is also a member of MGBC (Malaysia Green Building Confederation). Simultaneously, the group seeks to continuously provide quality products and engineering services to all level of global industries.